After a shaky first-half Friday against St. John’s in which they were outshot 7-3, the Maryland offense took off. Patrick Mullins (1) scored the season’s first goal in the 51st minute before John Stertzer (1) followed up just four minutes later to give the Terps a 2-0 lead. In the 76th minute, senior forward Casey Townsend (1) scored his first goal of the year by heading in a corner kick from freshman midfielder Alex Shinsky and Maryland all but ended things, winning 3-0 over the Red Storm. In his first game in goal since 2009, Will Swaim recorded his sixth career shutout. 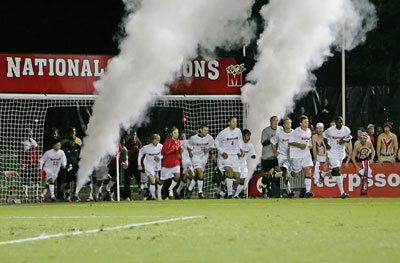 The Terps will play their first regular season game at Ludwig Field this year as No. 4 Maryland takes on No. 17 West Virginia at 7 p.m tonight. The Mountaineers are coming off a 1-0 victory over No. 11 Virginia and boast a very strong defense. West Virginia did not allow a shot on goal in their win Friday and the Cavaliers only tallied three total shots. Junior goalkeeper Pat Eavenson played in all 90 minutes in goal for his first career shutout. Their backline will be put to the test against a very talented scoring group for the Terps, who ranked as college soccer’s best offense last year and return plenty of offensive firepower this season. Maryland head coach Sasho Cirovski is 297-123-29 at the helm in College Park. He needs just three wins to reach 300 victories as the Terps’ head coach. Maryland is 7-3-1 on its opening weekend since 2006. The Terps fell to No. 24 Michigan State 4-3 in overtime in their home opener last season before pounding Northeastern, 5-0, two days later. Two players on the watch list for the MAC Hermann Trophy will match up with each other tonight. West Virginia senior defender Raymon Gaddis will clash with Maryland senior forward Casey Townsend as the Mountaineers look to slow down the Terps’ offensive attack. You can listen to the action on WMUC Sports at 6:45. I will be on the call with Eric Morrow. This entry was posted on August 29, 2011 by Scott Kornberg. 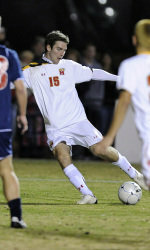 It was filed under Maryland Terrapins, Soccer and was tagged with Alex Shinsky, Casey Townsend, Cavaliers, Cavaliers soccer, John Stertzer, Maryland, Maryland soccer, Maryland Terps, Maryland Terps soccer, Maryland Terrapins, Maryland Terrapins soccer, Mountaineers, Mountaineers soccer, Pat Eavenson, Patrick Mullins, Raymon Gaddis, Terps, Terps soccer, Terrapins, Terrapins soccer, Virginia, Virginia Cavaliers, Virginia Cavaliers soccer, Virginia soccer, Wahoos, Wahoos soccer, West Virginia Mountaineers, West Virginia soccer, Will Swaim.